It's almost Pentecost! The church year is just flying by, and we're thinking that we might tempt you with something sweet. Hmmm, tempting, you say? For two-part mixed choir - men and women [trebles] with organ. An idyllic, sumptuous setting of a text by Christina Rossetti. The two parts start in unison, then enter in canon, then move into gentle harmony. Nothing difficult about this one - just exquisite writing. You will love it! The text is general enough to sing anytime, based on Matthew 6:26-28. A perfect summer anthem: flowers, birds, God's grace ... what more could you ask for? Of course, our cunning plan in offering you this free anthem is to get you to realize that a yearly subscription to SJMP (only $139) will allow you to download anything and everything on this site - well worth the price - just calculate the cost of three or four new anthems for your choir. We put 125 new works on the website last year - anthems, cantatas, organ pieces, hand bell music, hymn harmonizations ... these added to the already 1650 works already there - a HUGE catalog, and something for everyone. So, if you're not yet a member of SJMP, we're happy to entice you with this FREE ANTHEM. YOU DO HAVE TO LOG-IN TO DOWNLOAD THIS ANTHEM. BUT - As a subscriber, ANY and ALL of the music on SJMP is yours to download and reproduce. NO EXTRA CHARGES. NO MORE MUSIC TO PURCHASE. INSTRUMENTAL SCORES AND PARTS ALWAYS INCLUDED. AND NO LIMIT. (Amazing, isn't it?) Anthems, Psalms, Organ Music, Descants, Brass and Organ Hymn accompaniments, Cantatas, a Children's Music program, Hand bell Music, Service Music Settings ... just give it a look. Wow! Need help choosing music for a particular Sunday? Check out our Liturgical Calendar. Need to save something for later? Just add it to your "Favorites" list. Need to find an anthem for Two-Part or SAB Choir and trumpet? Click on Enhanced Search. 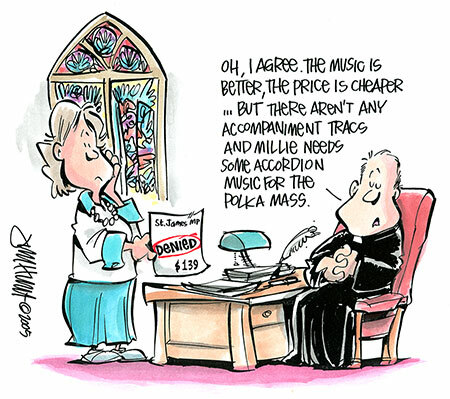 If there's a better resource for church musicians out there, we haven't found it. We have new pieces going up on the site every week, so be sure and check back often! Have a blessed (and fiery) Pentecost!